Here’s what people are reading lately here at the bridge. The top five most popular posts in the past 30 days. My New Best Friend. Thoughts on Rule Makers. How to Build a Youth Ministry From Scratch. I also want to invite anyone in the greater Lakeland area who has a junior high student living in their home or knows a junior high student living in someone else’s home (that’s pretty much everybody) to invite and drive them* to Crave. 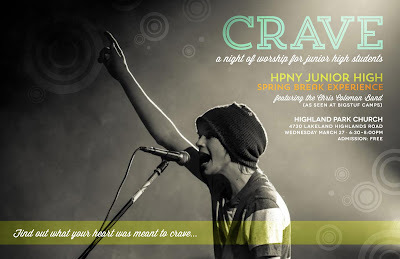 Crave is a new Spring Break worship experience for junior high students. In stead of backing off and letting programming rest this spring break week, I wanted to take the open Wednesday night and go deeper with our youngest teenagers in worship. The event is FREE! We’ve hired the best worship band for students to help us go there. *teenagers under the age of 16 shouldn’t be driving, unless you live in Polk County, and they own and personally know how to operate a bike, tractor, horse, etc.